I hope this post goes live as scheduled because there's nothing I can do to fix it right away if it doesn't. 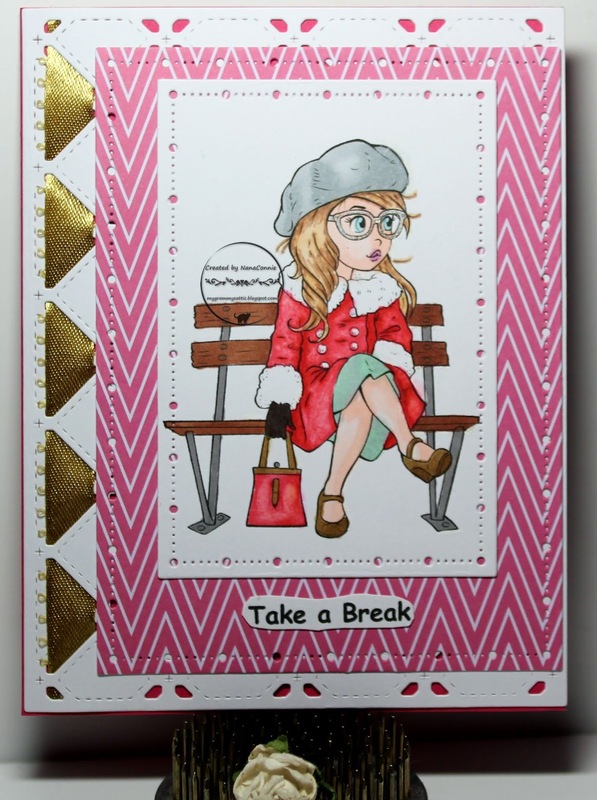 :-D We have our latest monthly challenge starting over at Creations in Pink and our theme is always "Anything Goes with Lots of Pink." Each challenge starts on the 15th of the month and runs until the 14th of the following month. I colored with ProMarkers, then used a Gina Marie die to cut out the image. The chevron paper is a scrap from my stash and I cut it with another Gina Marie die from that same set. The white background piece was cut with a die from Memory Box. I backed it with solid pink CS and ran gold ribbon through the cuts along the left edge. I printed the sentiment, hand cut it, and added it below the image. 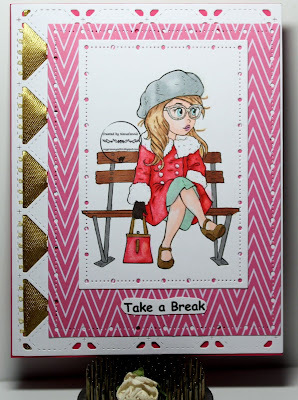 This is gorgeous Connie, love the image and beautiful papers. Beautiful card! Love the papers you used to make this beauty! Another wonderful card Connie. She looks like everyone feels about this busy time of the year. Love your card. Fabulous card. Thank you for joining us at Aud Sentiments challenge. We have a DT call at the moment if you would like to join us add a DT after your name. She looks very tired shopping for the Holidays ;P Beautiful card. Very cute christmas card! Thank for playing with us at Di's Digi challenge.